ホーム > 新着情報 > 【育児講座】ーフロンティアキッズ夏目坂ー歌って楽しく英語を学ぼう！！ 【Child care course】Let's sing and enjoy learning English! ! 【育児講座】ーフロンティアキッズ夏目坂ー歌って楽しく英語を学ぼう！！ 【Child care course】Let's sing and enjoy learning English! ! 【Child care course】Let's sing and enjoy learning English! ! 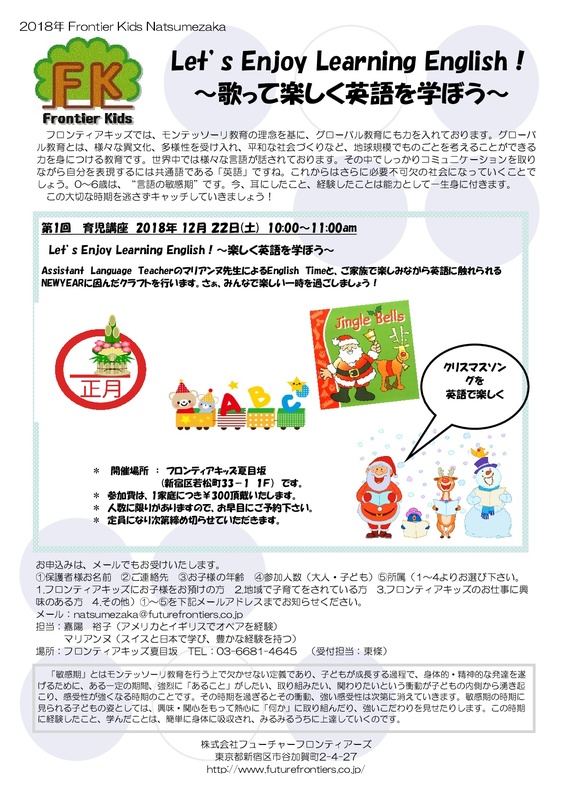 We will do crafting in accordance with NEW YEAR that you can enjoy English with your family while having fun. I think that it will be an opportunity to see how children of Frontier Kids Natsumezaka are familiar with English. Because it is the content which can be taken in at home, please come with your family all together. If you would like to participate, please contact us by email or TEL. country and daycare of local children. Au Pair, also called Mothers Help.